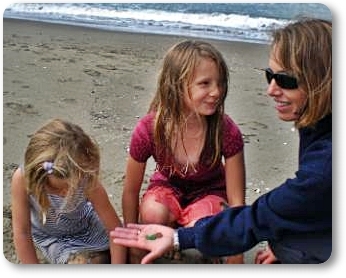 Sea Glass - A Fun Day at the Beach! For years,probably throughout history, people of all ages have enjoyed walking on the beach. And it's natural to pick up interesting objects that you find as you walk along enjoying the fresh air, scenery, and sounds. 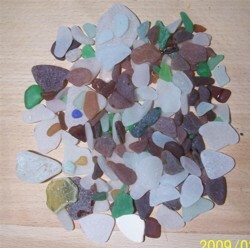 One of the beach finds that has a tendency to make a collecting fanatic out of a person is sea glass or beach glass. It's broken pieces of discarded glass, usually from bottles, that finds its way to the seashore. With constant wave action, this glass is tumbled and burnished to a rounded, softly glowing, frosted thing of beauty. For that reason, sea glass is also called gems of the sea or mermaid's tears. Sea Glass or Beach Glass? 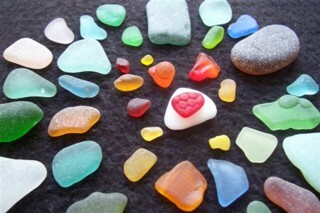 When found on a fresh water beach, such as the Great Lakes of the US and Canada, it is called beach glass. Naturally, sea glass would be those shards of glass found on a salt water shore. Common colors of sea glass would be white, brown, and beer bottle green. The rarest color is probably red, with true yellow and orange also very rare. Collecting sea glass is a growing hobby. It can be used in a variety of craft projects and makes beautiful jewelry.